Jesus knew how scary it is when someone gets really sick. He knew how sad it is when someone dies. Jesus cried when his friend, Lazarus, died. But he did something at his friend’s tomb that changed everything. He showed that he came to give his friends life after death. 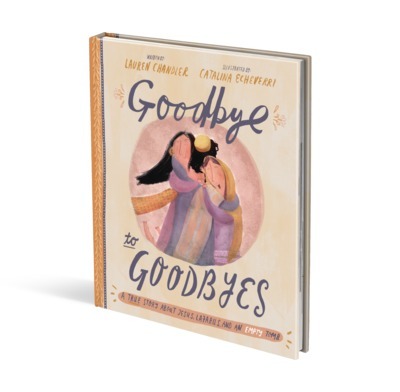 In this vivid, moving and exciting retelling of the story of Lazarus, Lauren Chandler helps children understand that Jesus came to say goodbye to goodbyes—forever. The author, Lauren Chandler, used the story of Lazarus to help her own children in the wake of her husband’s (Matt Chandler) brain tumor. Whether children are coming to terms with the illness or death of a loved one, or simply fearful of when that day might come, this book reassures them with the amazing truth that Jesus came to give his friends life after death. In this winsome little book, Lauren Chandler applies resurrection reality to the heart, in a way that will help both adults and kids face death with faith and hope. God always tells the best stories—for adults and for kids. Whatever our age, we need to hear Jesus say again and again, "Take away the stone." Lauren Chandler helped to bring this precious story alive for me in new ways as I saw it through my daughter’s eyes. This book is a sweet gift to parents—for our children and for our own souls. Goodbye to Goodbyes gives our kids a big, colorful view of the God we serve and His defeat of sin and death forever! Goodbye to Goodbyes is a wonderful book. I bought the book for my son named Lazarus, but once we read it as a family we were just blown away by how great it is. This book goes right through the story of Lazarus - even highlighting some of my favorite parts like how because Jesus loved Lazarus, Mary, and Martha, he waited until the perfect time to go to them. The book uses the story of Lazarus to bridge the topic of death and how because of Jesus we can say goodbye to goodbyes, because we will be together again with Jesus. Such and amazing book. I highly recommend it!